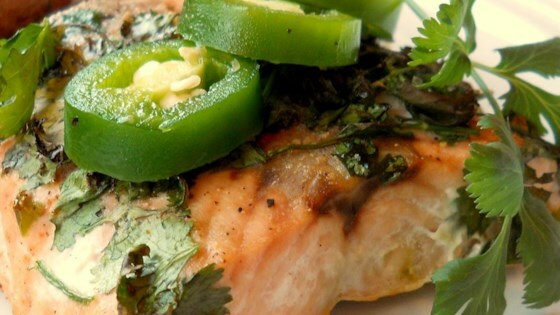 "Grilled salmon topped with cilantro, jalapeno, and butter." Lightly grease one side of a large sheet of aluminum foil. Place salmon on the greased side of foil. Melt the butter in a saucepan over medium heat. Remove from heat, and mix in cilantro and jalapeno. When cilantro is wilted, drizzle butter mixture over the salmon. Place foil with salmon on the grill. Season with Old Bay. Cook 15 minutes, or until fish is easily flaked with a fork. Excellent! I too thought butter might be too heavy so I brused the salmon with olive oil and squeezed fresh LIME juice ..it only compliments the cilantro and jalepeno flavor..yummy!